XH648 first flew on 27th November 1959 and was delivered to 57 Squadron at RAF Honington in December 1959. In October 1960 she was returned to HP at Radlett and converted to a B.1A (lots of new ECM equipment, uprated engines, improved radar and radio etc.) and return to the RAF in May 1961 - 15 Squadron at RAF Cottesmore. During 1962/63 she was part of Exercise Profiteer during the Indonesian Confrontation. In April 1964 she was assigned to 55 Squadron, and began low level sorties, losing her white paintwork and gaining green/grey camouflage instead. With the grounding of the Valiant fleet due to spar fatigue issues, an urgent need for replacement tankers was identified and XH648 was selected to be one of six B.1s converted to two-point tanker status. This meant she retained the ability to go and bomb something if need be, and resulted in a change of designation from K.1A to B.1A(K2P). Returned to 55 Squadron at RAF Honington in April 1965, they soon moved to RAF Marham, and when they began converting to Victor K.2s in June 1975, XH648 moved to 57 Squadron for a final year of service before being retired to Duxford on 2nd June 1976. While at Duxford, Duxford Aviation Society members kept the airframe 'live' and regularly exercised many of her systems including flying control demonstrations, bomb bay openings, refuelling hose extensions and so on. She had a lot of work done on her between 1986 and 1989, culminating in a repaint which left her in superb condition. However the IWM management decided her gloss finish was not accurate (despite being far more practical) and ordered a matt varnish to be applied. A chemical reaction between the paint and the varnish left her looking absolutely awful within a matter of months, and the management also forbid any further demonstrations of her systems due to the dreaded 'Health & Safety'. The result was a forlorn and sad looking aircraft. 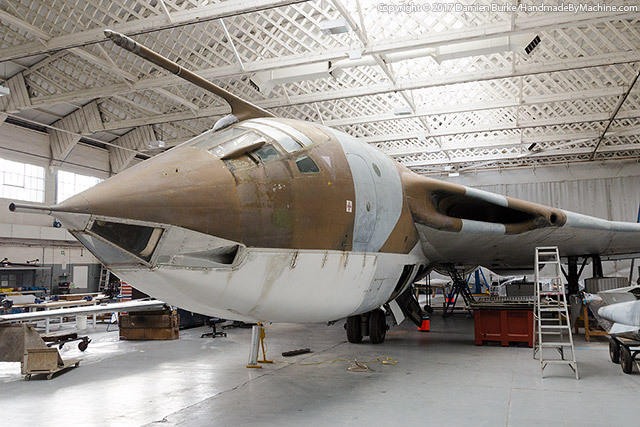 Thankfully during 2007 XH648 was moved indoors to the AirSpace hangar and finally in 2016 an in-depth restoration was begun, which has seen the airframe dismantled and being brought back to bare metal - a really thorough job seems to be in progress.